Something interesting happened to me when I was young. At the age of 14, I stayed up late one night as I sat on the couch surfing aimlessly through tons of reruns and bad programming. As I continued to scroll through the TV guide with a plate of burger sliders on my lap, I ran across a documentary called, “Food Inc.” This film dramatically changed my perspective. I watched the slaughter production in sheer disgust and woe. One beloved slider in hand, I cautiously dropped it back on my plate as I witnessed cows being poked, prodded and thrown around like useless trash bags right before my eyes. I became a vegetarian in that very moment. I was a vegetarian for several years. With the weight of pricey tuition bills and a severe lack of the ability and time to prepare home cooked meals, I reverted back to what I considered to be an easy diet. When going out for food, it became difficult to turn down the $1 cheap, greasy burgers for more pricey selections like tofu stir fry. But recently I read an article about the dangers of eating red meat that motivated me to again take action. I decided to take a health challenge to cut out red meat from my diet for seven days to see how it would affect my body after eating red meat for the past four years. Skipping out on red meat won’t automatically make you wake up #flawless Beyonce-style, but it will help improve your health in many ways. Here’s what happened when I stepped away from red meat for seven days. Although I’m in the age range of someone who should have bountiful amounts of energy, I’ve always struggled with sustaining high energy levels, especially after eating red meat. When I stopped eating red meat for seven days, I actually woke up with energy! Once I got past the initial withdrawal pangs from the “no-meat week,” things started to improve. As each day passed, I became steadily more energetic. There wasn’t an absurd difference in my energy levels to the point where I was bouncing off the walls but I definitely woke up each morning refreshed and less irritable. After seven days without red meat, my stomach was also less bloated. That’s because eating more red meat is linked to unfavorable plasma concentrations of inflammatory and glucose metabolic biomarkers in diabetes-free women such as myself, according to a study by The American Journal of Clinical Nutrition. 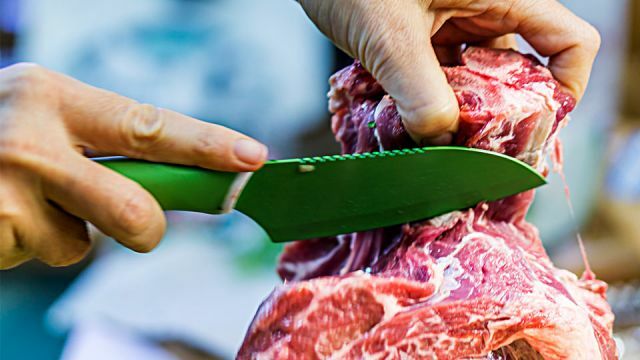 Researchers say replacing red meat with a different protein food is known to be associated with a healthier biomarker profile of inflammatory and glucose metabolism. One old adage, “you are what you eat,” still rings true in 2018. Since your skin is the largest organ in your body, it’s important to care for your skin every day. The condition of your skin is directly affected by what you eat. Prior to this challenge, I suffered from the occasional skin issue. I like to call it the “sleepy eye” look. There are some nights when I get adequate sleep and I still may have dark circles under my eyes — even with eight hours of sleep! Surprisingly, kissing red meat goodbye from my diet for seven days reduced my tired look. After replacing my normal red meat meals with fruits and vegetables, I noticed my skin appeared to be refreshed. The fruits and vegetables that I used to create healthy meals were loaded with important vitamins like A and C, which are known to fight and ward away blemishes. This helped me maintain a healthy glow. A healthy amount of vitamin C stimulates collagen synthesis and helps aid antioxidant protection against UV-induced photodamage, making your skin healthier and more durable in the sun, according to a study by Nutrients. I’ve always heard the phrase, “Don’t eat meat before bed or you’ll have bad dreams.” Prior to cutting out meat, I often suffered from outrageous dreams that would leave me feeling exhausted in the morning. Convinced the correlation between eating meat and stressful dreams was an old folktale, I never truly thought my sleep would be significantly improved with the absence of red meat in my diet — but it has! Ditching red meat eliminated my pesky overactive dreams and helped regulate my sleep. My sleep schedule naturally fell into a normal sleep cycle. Let’s face it. You’ve probably eaten a gigantic burger, that in the moment, was like a sweet siren calling your name — but you later paid for it in the restroom (too much information, I know). Red meat is the type of food that can cause you to feel extremely weighed down. Because red meat can create extra stress on your stomach and intestines, eating too much red meat can increase your time spent in the restroom. Eating red meat frequently can disrupt your digestive system from performing properly. Red meat is associated with an increased risk of cardiovascular disease, diabetes and death. Consuming red meat often can cause your body to strain to digest food causing you to spend more time in the restroom as you attempt to have a bowel movement. In a study by Cancer Epidemiol Biomarkers Prevention, research shows an intake of processed meat was associated with a risk of squamous cell carcinoma (SCC) of the upper aero-digestive tract (UADT). Doctors recommend reducing red or processed meat to decrease your chances for digestive complications and colon cancer. When I cut out red meat, I experienced an extremely visible difference in the amount of time it took my body to digest food prior to a bowel movement. Without heavy red meat slowing down my body’s digestive process, I found going to the restroom to be a lot easier, especially in the morning. In the past, I’ve had to drink extra water in the morning to help my body pass whatever food I ate the previous day. But since cutting out meat, I have had significantly fewer issues. Have you ever tried cutting out red meat? What was your result? Tell us in the comments below! Hey Buddy!, I found this information for you: "I Cut Red Meat Out Of My Diet For 7 Days. Here Are 5 Surprising Things That Happened". Here is the website link: https://www.thealternativedaily.com/i-cut-red-meat-out-of-my-diet-for-7-days/. Thank you.